When a customer commits to spending money with you how do you label that cash? Revenue? Nope. You can't call it revenue because no service has been performed and you haven't collected a single dollar yet. So, this in-between period is pretty much a customer saying "hey, I want to spend money with your company, here's what I'll commit to spending". In SaaS we call this a booking. 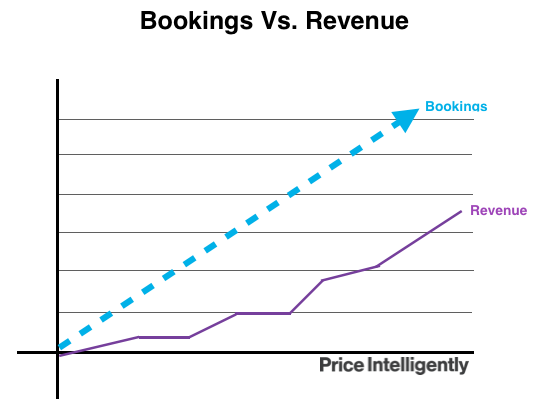 Bookings are an annualized recognition of the many streams of recurring revenue (MRR and ARR) your SaaS business generates. Put another way: bookings are the sum of all the revenue promised to your business through any contracts signed. Not tracking and measuring these revenue streams in the proper fashion can bring audit troubles (read: the government not being happy with you), or worse miscalculate the growth of your business and potentially nose dive too far into the red. 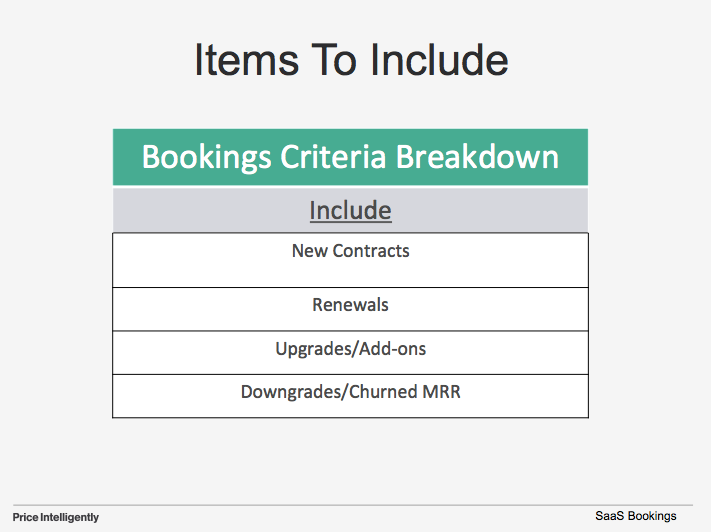 To clear up any confusion, let's take a look deeper into what exactly is a booking, why it's important, and how you can best optimize bookings for your SaaS company. To sum up Bookings in one sentence: Bookings are the total dollar value of all new signed contracts. Typically recorded as an annualized number even if the agreement period is longer than a year; this metric allows you to accurately visualize and keep track of the money customers have committed to spending with you. Bookings are also an indicator and demonstrator of the demand for your product, giving you an accurate picture of how the market is responding and readily committing to your offering. So along with the other financial metrics (MRR, ARR, LTV, CAC), bookings is paramount in predicting the financial future of your business and strategically keeping you on the growth path to get to your goals. "Not tracking Bookings is like inflating your financials with hot air; it's just not accurate"
Bookings is a key financial metrics that allows you to understand your inflows and outflows of cash. The main areas of importance involve finance and your product team. Crucial financial metric for tracking the cash coming into and will be coming into your business: Bookings is a crucial financial metric because it keeps you from inflating your MRR/ARR. It allows you to account for the money customers have committed to spending with you without falsely recording it in your finance spreadsheets as revenue before the exchange of service has taken place. Product, marketing, and sales team motivation: Your product, sales, and marketing teams should be motivated by bookings to continuously develop an amazing experience along with complementary features that line up with your value metric to increase committed contracts. Additionally, annual contracts are a wonderful way to boost bookings considerably. 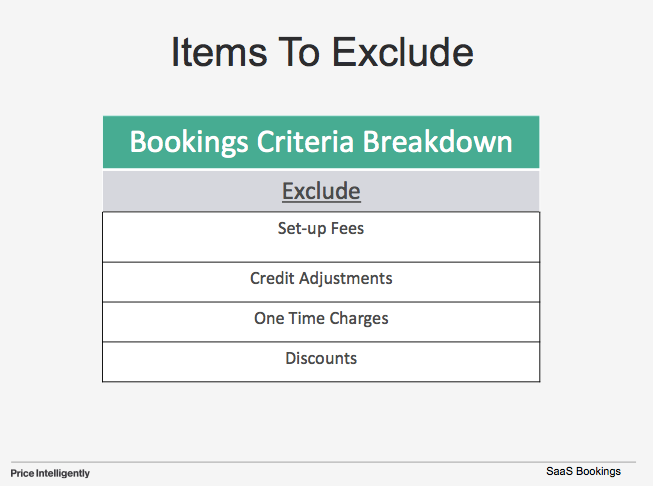 With bookings, you want to include all items that are associated with revenue. When a customer commits to spending money with you - that's a booking. You need to adjust that number as the commitment changes, particularly in terms of downgrades and any churn. The key to getting accurate Bookings metrics is to understand that it is an annualized recognition of revenue items coming into your business. So, you want to exclude any items that do not fall in that category. The reason for this is bookings are tracking your committed momentum from your growing customer base. While recognized revenue will be different, remember that your bookings are measuring where you're headed. Bookings is a testament to the aligned value that customers have with your products and where your business is heading based off their committed revenue. 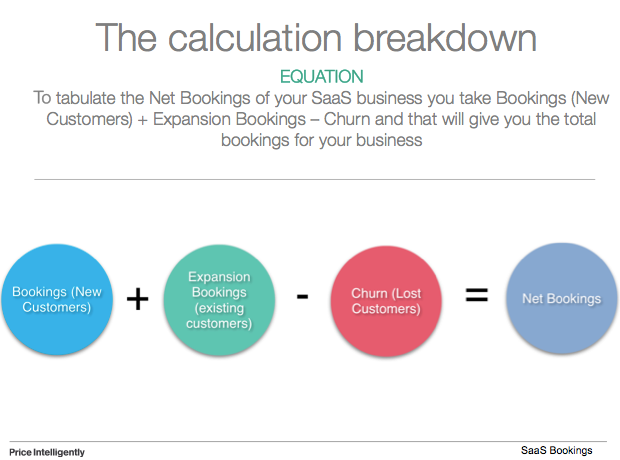 There is a direct correlation between Bookings and Revenue so the higher your bookings go - the more revenue you can expect to receive throughout your SaaS business journey. Here are some actionable ways you can increase your bookings and generate more revenue for your business. Make sure your product is aligned with a value metric: By aligning your product with a value metric you ensure that the value of your offering is in tune with your customer persona. This in turn allows you to expand the amount of revenue your customers are committing to you as their usage expands. Reduce MRR Churn through quantifying your buyer personas: Quantify your buyer personas beyond a few clever names and slide decks, because when you know your customer, you'll start to be able to identify where you can improve in reducing churn. MRR churn is the kryptonite you need to avoid in your business and knowing your customer is the best way to optimize this metric. Annual and longer term contracts: While you may not bill your customer all up front (or maybe you do, which you should be optimizing for), the longer you get your customer/prospect to commit to a contract, the longer and more your bookings will rise. Work on making sure you're optimizing for longer contracts that expand on a value metric (chatted about above).